The Scandic Vaxjo offers a sauna and an indoor pool, along with free Wi-Fi. Vaxjo town centre is within an easy 10-minute drive of the hotel.The Scandic Vaxjo features include conference room(s), meeting rooms and a business centre. Fitness facilities can be readily accessed by those who'd like to keep an eye on their health and wellness while away from home. 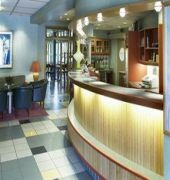 The hotel's multilingual staff will be happy to share local knowledge and help you organise your stay in Vaxjo.Rooms at the Scandic Vaxjo are well-appointed and offer all the essentials including a safe, cable / satellite channels and a TV. 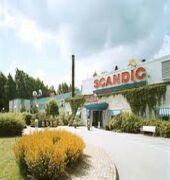 Also included in the rooms are an iron, a trouser/pant press and a telephone.With a relaxing ambience, the Scandic Vaxjo's on-site bar offers a range of premium drinks and snacks. 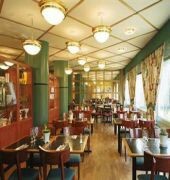 Guests can also enjoy a meal in the hotel's restaurant, along with a daily breakfast.